여주이씨 옥산문중 전적 - 사마방목(驪州李氏 玉山門中 典籍 -司馬榜目)은 조선 중종 8년(1513)에 실시한 사마시의 합격자 명단이다. 사마시는 생원시와 진사시로 구분되는데, 생원시 합격자 가운데 조선 전기의 대학자인 회재 이언적(1491∼1553)이 포함되어 있는 것이 눈에 띈다. 이것은 바로 그가 지니고 있던 것으로 책장머리에 ‘여성이씨’, ‘회재복고’의 두 도장이 찍혀있다. 구성을 보면 합격한 사람들의 자와 본관, 주소, 부의 이름을 적어놓았으며, 을해자 활자본이다. 이 사마방목은 조선시대 과거제도 및 주요 인물들의 전기를 연구하는데 도움이 되며, 또한 예종 원년(1469)에 실시한 사마방목을 성종 7년(1476)에 갑인자로 찍어낸 것에 이어 2번째로 오래된 것이다. 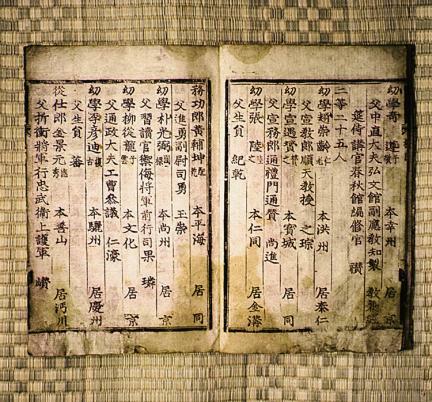 The Book Collection of the Oksan Family of Yeoju Yi’s Clan - State Examination Roster is the list of those who passed the state examination administered in 1513 (the 8th year of the reign of King Jungjong of the Joseon Dynasty). The state examination included two tests of different levels. Yi Eon-jeok (1491-1553), one of Joseon’s greatest scholars, was among those who passed one of the two tests. This copy, which belonged to Yi, has two stamps identifying him. The roster printed in the type called Eoraeja includes the selected applicants’ family clan, address, and father’s name. This roster contributes greatly to the study of Joseon’s state examination system and major figures’ biographies. As the second oldest after the roster for the exam of 1469 (the first year of the reign of King Yejong), it was printed in the gabinja type in 1476 (the 7th year of the reign of King Seongjong).